sarah ahearn bellemare: sneak peek!!! 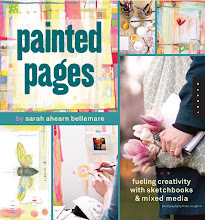 color pattern paint promo from Sarah Ahearn Bellemare on Vimeo. it's here! a little sneak peek of my class! we had a lot of fun putting it together! the only challenge was finding a time when there wasn't a babbling and/or fussy baby in the background... but that's what i get for working from home! what you don't see is A LOT of footage of ada wandering through the studio... ya know, just "passing by" as she claimed! then she finally admitted: "i want your students to know you have a child". ahem. so, she got her cameo at the end AND got to be the one to say "action". ha! whatever works is my motto these days! i hope you'll enjoy watching a little peek into what the class will be like! and yes, space is limited, so sign-up for your spot! class begins on july 14!!! ps: if you are a returning online student (you've taken p&p or ppw part 1) there is a super discount code! just email me at colorpatternpaint AT gmail.com in case you need the code! thanks! I loved Spiderman but I just love Sam Rami so Im biased but I just thought Id say that the Watchmen was the biggest waste of three hours in my whole life. It was really bad. I don’t care what Ebert said, it sucked balls and a half. I feel that your perspective is deep and everything is pretty good given the perceptions and opinions logic together.